Apple has reported its second straight quarter of falling iPhone sales, hit by stiff competition in China and the ongoing slowdown in the worldwide smartphone market. The company sold 40.4 million iPhones from April to June, down from 47.5 million in the same quarter last year, Apple announced Tuesday. Revenue for the quarter, the third of its fiscal year, was $42.4 billion, down 17 percent from $49.6 billion a year earlier. Its net profit fell 27 percent to $7.8 billion. While the iPhone was an obvious low point, sales were down across all of Apple's main device lineups. The company sold almost 10 million iPads and more than 4.2 million Macs, compared to almost 11 million iPads and 4.8 million Macs last year. Even the company's "other revenue" segment, which includes the iPod, Beats headphones, and Apple Watch, saw declining revenue. Apple's strategy of focusing on selling high-end professional tablets may be paying off, however. While iPad unit shipments fell, revenue from those products rose sequentially and year over year. Apple made almost $4.9 billion from the iPad during its fiscal third quarter, compared to roughly $4.5 billion during the same period in 2015. Another small bright spot was the revenue Apple gained from its services businesses, including sales from the iOS App Store, Apple Music, and the iTunes Store. Those businesses generated $5.98 billion in revenue, up from $5.03 billion in the year-ago quarter. Still, revenue from those services was down sequentially, compared to $5.99 billion in Apple's fiscal second quarter. Despite the slower sales overall, Apple’s profit of $1.42 per share beat the modest forecast of Wall Street analysts, causing its stock price to climb in after hours trading. It’s shares on the Nasdaq were up nearly 7 percent at the time of this report, at $103.15. Apple is expected to release a new version of its smartphone in December, though there are conflicting reports about what it will be called and what it will be capable of. In the past, these releases have reinvigorated iPhone sales, especially as users reach two years after they purchased their previous phone. 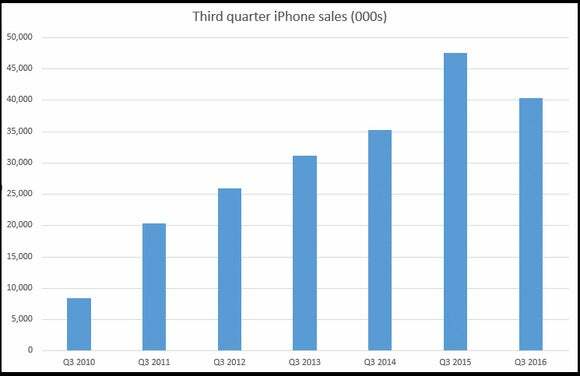 Sales of the iPhone saw a massive jump in 2015, following Apple's release of the iPhone 6. Maybe lightning can strike twice.